On a recent trip to North Dakota, we had a 10 hour layover in Denver. I'd never been to Denver and thought this would be the perfect day trip. I didn't factor in that we'd have to carry ALL of our bags. Oh and the altitude (keep in mind, we are coming from sea level). Regardless, off we went! We took the train downtown. It was a beautiful day to visit Denver. We were both ravenous so we stopped in at Snooze an A.M. Eatery, which is a restaurant that has long been on my list. Whenever we travel, my boyfriend and I love to taste as much unique food as we can. It's not unusual that we will order three entrees between the two of us, so of course we did here. We got a pancake flight, which was delicious (and totally nuts considering our actual entrees were huge). For our flight, we got the Pineapple Upside Down Pancakes, the Sweet Potato Pancakes, and the Blackberry SubLIME Pancakes. The Blackberry SubLIME Pancakes were my favorite. They tasted like key lime pie. I'd love to try to recreate them at home. 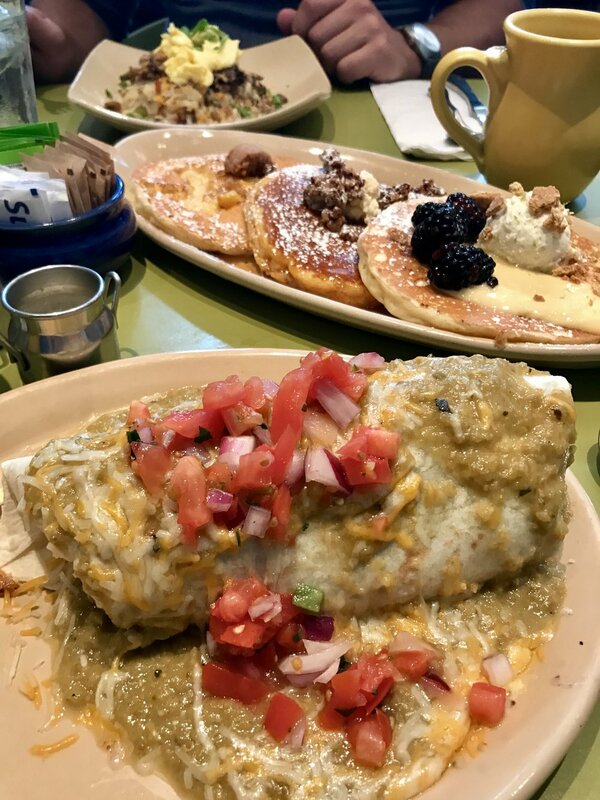 I got the breakfast burrito for my actual meal since the pancakes were more of an amuse bouche. It was covered with green sauce and cheese. Highly recommend. The boyfriend got the Snooze Spuds Deluxe (these were seriously amazing). Overall, it was such a good experience, the ambiance was nice, and it so so so yummy. I will definitely be back. On a side note, Denver is a blast! Not to knock Portland, but Denver was probably once of the cleanest cities I've ever visited. And it was so beautiful. I'm excited to go back one day.